Mosaic Tile Museum, Tajimi is a museum opened in June, 2016 in Kasahara Town, Tajimi City. Following years of preparation led by organisations representing the local mosaic tile industry, which boasts the country’s largest production volume of mosaic tiles, the museum project has at long last begun to be fully operational. Mr. Itsuzo Yamauchi, who was born in Kasahara in 1908, came back from his study at the workshop studio of the Kyoto City Ceramic Research Institute. He created glazed porcelain mosaic tiles and developed an efficient system. 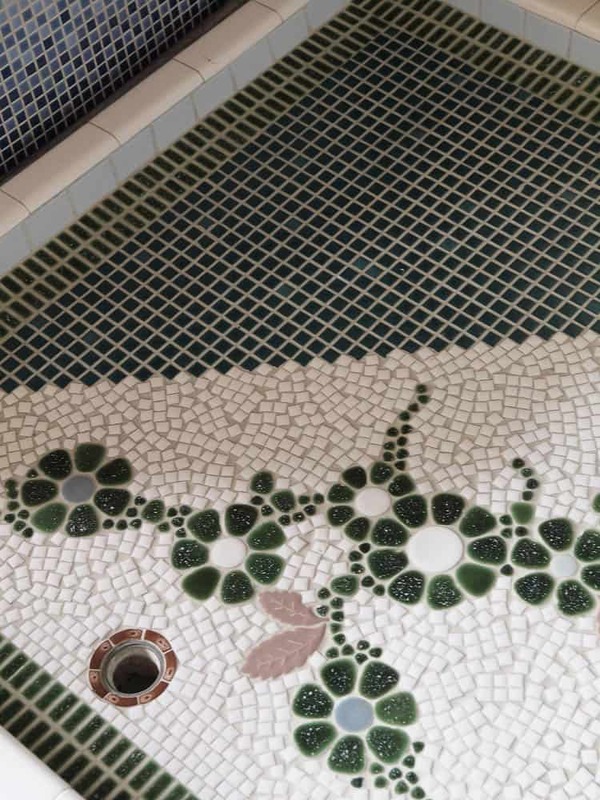 One of the turning points, which accelerated the spread of mosaic tile, was a large quantity order from the Allied Occupation Forces in the immediate postwar period. 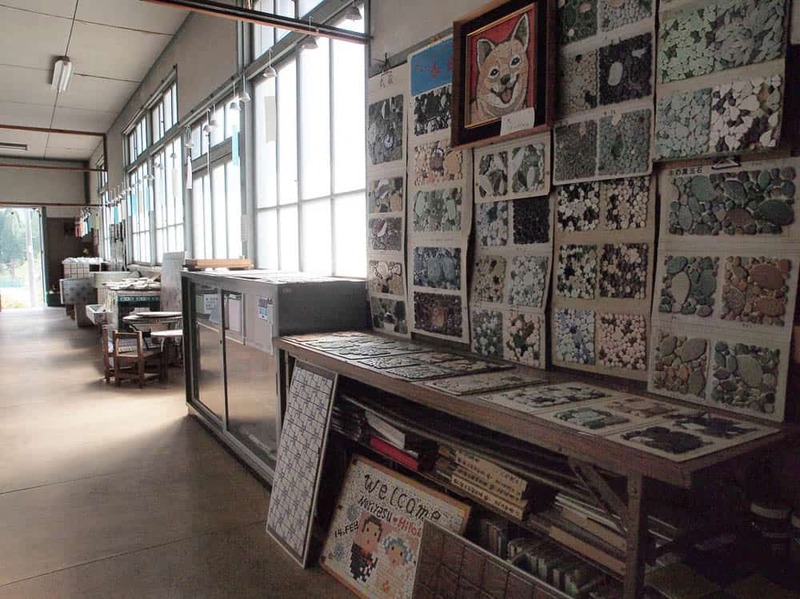 Then, export of mosaic tiles became active and many of the factories in Kasahara-cho which were producing rice bowls made the shift to tile production. That was how Kasahara-cho became the tile producing town. When local tile production was starting to decline, it was felt that the local tile industry needed to maintain pride in its manufacturing heritage, and a dozen volunteers, who are mostly the members of the local chamber of commerce and industry, tried to find a way to proudly bequeath a legacy of tile industry and manufacturing technique to future generations. They set about their efforts on voluntary bases to salvage tiles from buildings earmarked for demolition, and asking tile factories closing down for product samples. 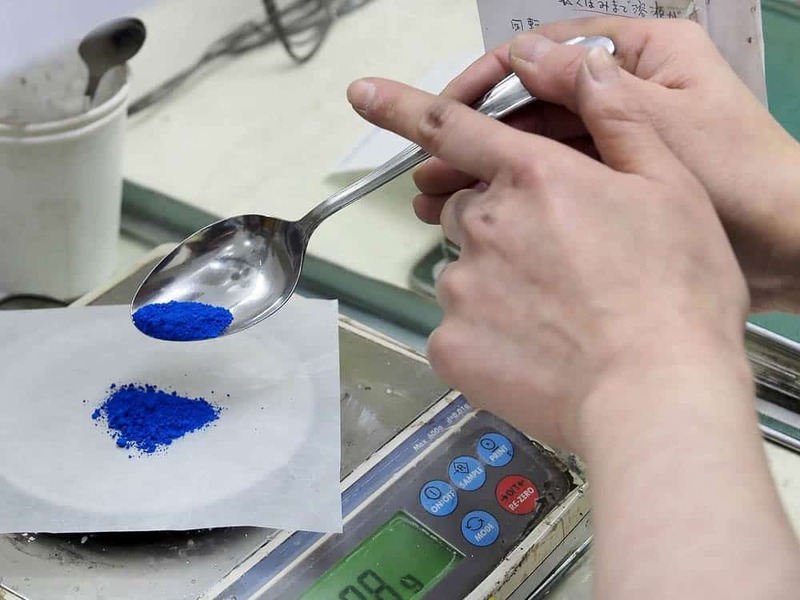 Sometimes with the assistance of the municipal government, they collected large-scaled products such as walls of a public bathhouse, and fragments of aerospace laboratories of the University of Tokyo. The construction project of the museum for exhibiting the collection in public was first proposed as a large-scale movement arose to promote the merger of cities and towns of western Mino Province. In 2006 when Kasahara-cho was merged with Tajimi city, the project made substantial progress. Tajimi city decided to set to work on the construction with the aid of deficit-financing government bond. 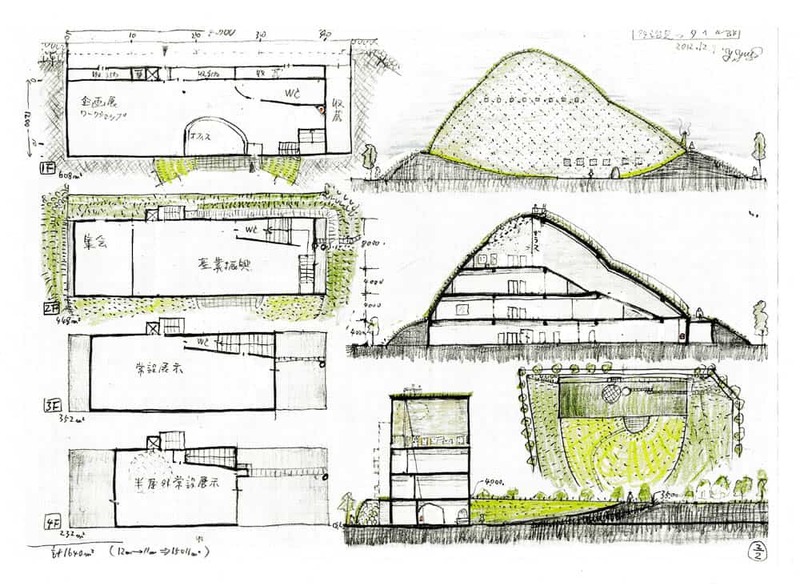 And in 2011, they decided to request Terunobu Fujimori to design the museum building. 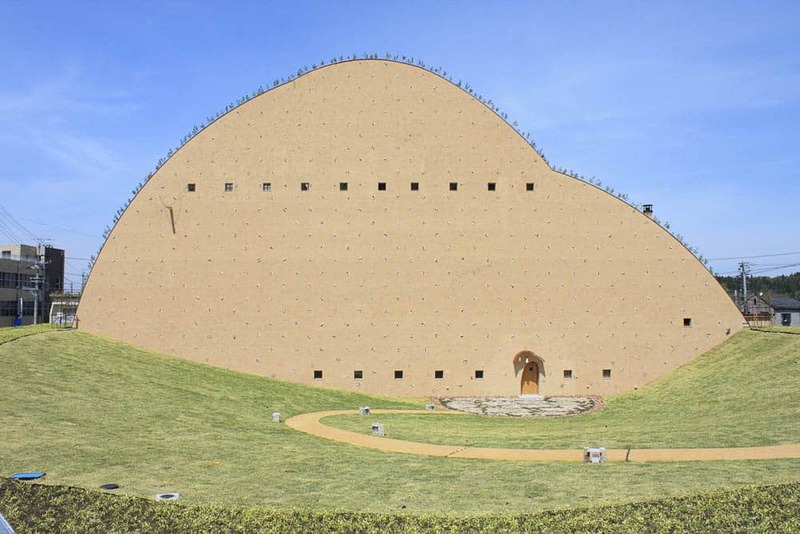 Terunobu Fujimori believes that “clay” has been the most fundamental material constituting a built structure since ancient times. 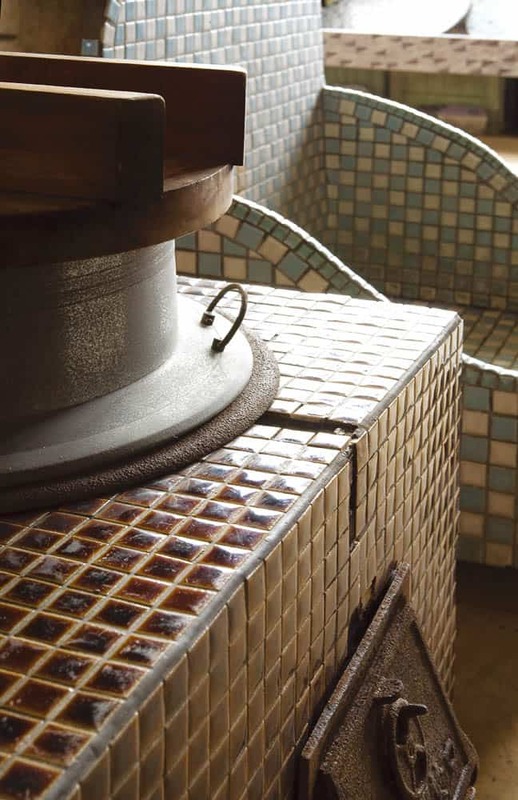 Tiles are, of course, among the many building materials made by fired clay. The design for the Mosaic Tile Museum was inspired by the views of quarries for extracting clay. The façade of the museum is designed to evoke associations with earth, and is embedded with all sorts of tiles. Roof tiles are used on the side elevations, and the contours are defined by a planting of pine trees. The site slopes gently toward the entrance in the manner of an inverted cone. The museum is expected to house over 10,000 artifacts and other materials. Most have been collected over the last two decades by local volunteers and kept at a facility named “Mosaic Roman-kan (memorial house).” The collection includes tile sample books/boards and tile products of the past, such as wash basins, bathtubs, and export goods, as well as tools and utensils formerly in use. The museum is a four-story building. 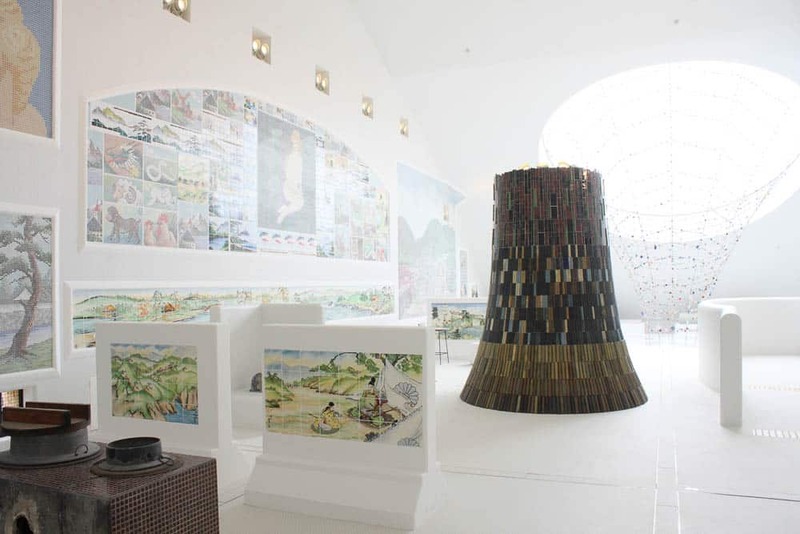 The display on the 4th floor, which was supervised by Fujimori himself, consists of permanently installed large-size artifacts such as removed mural of mosaic and painted tiles brought from public bathhouses, kitchen sinks, bath tubs, and so on. The architect’s thought must be that for capitalising on its uniqueness and charm, tiles should not be in display cases, but should be installed in their original form. Every space in-between these artifacts is filled with white round mosaic tiles from the top to the bottom, which gives a viewer a feeling of unreality. There is an opening space on the ceiling with a cone-shaped monument made by wire decorated with various mosaic tiles. The weather and time of a day have profound effects on the view of this space. The third-floor exhibition hall consists of collection exhibits that illustrate the history of local mosaic tile industry and its manufacturing process, accompanied by a small gallery for holding temporary exhibitions. We’ve already held five temporary exhibitions since the opening, each of which offered some different perspectives. For example, as the special exhibition commemorating the opening of the museum, we commissioned to the up-and-coming artist Shinji Ohmaki, asking for a new work using mosaic tiles. The exhibition was titled Echoes Infinity—Eternal Story—Shinji Ohmaki Solo Exhibition (from 4 June to 28 August 2016). Holding workshops several times and involving volunteers including neighborhood people, he created astonishing installation representing a concept of “mosaic tile”, utilising the entire display space of the gallery. 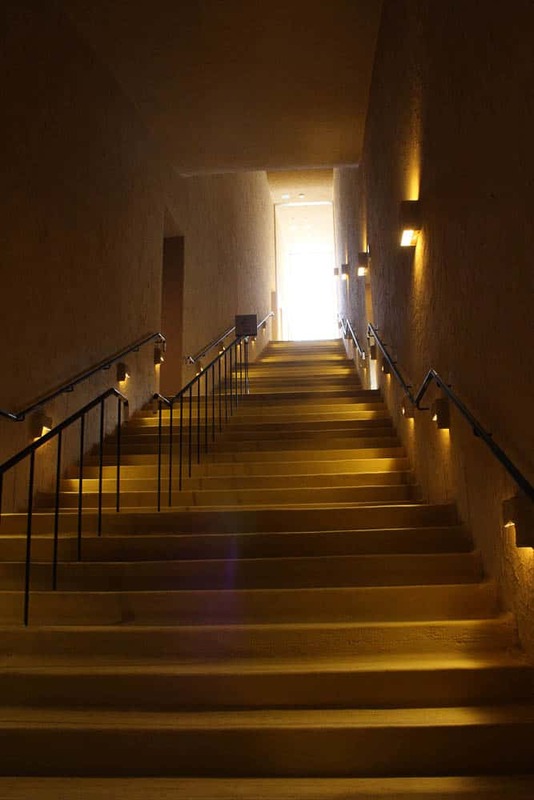 He also designed and installed impressive lighting equipment, consists of spinning lights and midget lamps. And he put massive amount of slips of paper with fragmented stories written on them. Visitors experienced representation of higher beauty of tiles. The latest exhibition is titled Paean to Factories: Process of Glazing (26 August – 26 November, 2017. It takes place as part of the project supported by a grant from Gifu prefecture, aiming at displaying the wonders of the industry and promoting exchanges among the interested parties. We exhibit in addition to materials that provide colour to tiles, tools, samples, and pictures to show the process of producing color glaze. Over the duration of the exhibition, we organised guided factory tours, workshops, and lectures, to facilitate the exchange between visitors and industry partners. On the second floor, we have an industrial development area, in which guests can actually choose tiles and make arrangements to use them for their planned construction. Actually, we are still struggling to make new rules and approaches of the operations for the museum, because such a challenge is unprecedented among museums in Japan. As observed above, Mosaic Tile Museum, which must be regarded as a long-term project, cannot be completed at the time of completion of construction, but instead, it has only started from that point to be expanding hereafter. 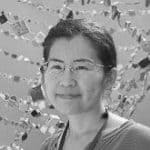 Nodoka Murayama is a curator of the Mosaic Tile Museum, Tajimi. She graduated the Tokyo University of Fine Arts and Music, received a master’s degree in Japanese Art History. The previous employment was an assistant curator of the Museum of Modern Ceramic Art, Gifu.